It is our great pleasure to remind you about the Sixth Conference on Artificial General Intelligence, which will be held in Beijing, China, this upcoming summer. The deadline for paper submission is coming up fairly soon — March 1. Details about the conference follow. As in prior AGI conferences, we welcome papers on all aspects of AGI R&D, with the key proviso that each paper should in some way contribute specifically to the development of Artificial General Intelligence. This Special Session will feature papers giving new AGI ideas inspired by current research in Cognitive Robotics. See http://www.agi-conference.org/2013/workshops/ for details of the workshops. Tutorials and demonstrations will be held alongside the conference. For the requirements for proposals, please see the AGI-13 website. Keynote speeches will be delivered by leading scientists in the area of AGI and adjacent disciplines; they will be announced at a later stage at the website of AGI-13. All papers have to be submitted via the conference submission page, to be announced at the AGI-13 website. The authors should not expect any extension of the deadlines, though special situations can be arranged in a case-by-case manner. If for a special reason your submission will be delayed for a few days, please contact the program committee co-chairs for advance approval. The conference papers will be published by Springer in the Lecture Notes in Artificial Intelligence (LNAI) series. Paper templates for both LaTeX and Word may be found here: http://www.springer.com/computer/lncs/lncs+authors?SGWID=0-40209-0-0-0 . Use the templates for “LNCS Proceedings and Other Multiauthor Volumes”. The LaTeX template (use of which is preferred) is also given directly here:ftp://ftp.springer.de/pub/tex/latex/llncs/latex2e/llncs2e.zip. 1. Full papers (up to 10 pages): Original research in the above areas. 2. Technical Communications (up to 4 pages): Results and ideas with interest to the AGI audience, including reports about recent own publications, position papers, and preliminary results. This book at Amazon . This science fiction novel is not about consciousness, but one of the most remarkable problems intimately related with it: free will. Written by the poet and writer Elisabeth Rhett Woods, the book uses a close and non technical language, flavored with some poetry, appealing to anyone interested in the subjects of AI and free will. No special knowledge is required to enjoy this story about life, where you, as a human being or as an intelligent sentient machine, can easily identify your fears, wishes and dreams with those of the characters. The story is based on the development of a new intelligent robot coyote who longs to be free. Wealthy poet, Zoe Neville, decides to make, with the help of friends, both a robot coyote and a film about this robot coyote being used to smuggle a small quantity of marijuana into the United States in a private protest against the invasive spy equipment the U.S. has set up along the border with Canada. Setting the main plot aside, the actual purpose of this work is to explores the development of consciousness, self and personhood, friendship between women and men, freedom, and what it means in practice to be free. Deadline extended: February, 15. 2012. This EAIS Edition will be held in Madrid, Spain, between May 17-18, 2012. One of the important research challenges today is to develop new theoretical methods, algorithms, and implementations of systems with a higher level of flexibility and autonomy, we can say with higher level of intelligence. Intelligent systems should be dynamically evolving and be able to adapt and learn. That is, the system must be able to evolve, to self-develop, to self-organize, to self-evaluate and to self-improve. The emerging area of Evolving Intelligent Systems targets non-stationary processes by developing novel on-line learning methods and computationally efficient algorithms for real-time applications. Some of the natural implementation areas of Evolving and Adaptive Intelligent systems are: wireless sensor networks, assisted ambient intelligence, embedded soft computing diagnostics and prognostics algorithms, intelligent agents, smart evolving sensors, autonomous robotic systems etc. EAIS 2012 continues the tradition established by the successful series of IEEE conferences starting with EFS’06 (Lake District, England), GEFS’08 (Witten-Bomerhoz, Germany), ESDIS’09 (Nashville, USA), EIS’10 (Leicester, England), and EAIS’11 (Paris, France). It will provide a friendly atmosphere and will be a leading international forum focusing on discussing problems, research, results and future directions in the area of Evolving and Adaptive Intelligent Systems. We are pleased to announce the AISB symposium “Enaction: Challenges and Successes” to take place during the AISB Annual Convention 2013, Univ. Exeter, UK, April 2-5th, 2013. Enaction represents one alternative to “good old-fashion cognitive science”, in the form of a change of focus for models of cognition: from computation to interaction, from the brain-in-a-vat to the embodied brain in the world. This extension, dubbed enactive cognitive science, arises from both the inability of current theoretical frameworks to account for recent data in the social and life sciences, and from growing debates on the defining features of a cognizant organism in its environment. The symposium will foster discussions around 1) the challenges that any alternative to current frameworks will have to overcome, and 2) the successes from enactive cognitive science that respond to shortcomings in the orthodox frameworks. The outcome of this symposium will be a critical perspective of the state of the field today, as well as a tentative roadmap for the future. It will be organised around talks and panel discussions. Papers should be no more than 7000 words, including refs and figures. All accepted papers will be provided to the AISB’13 delegates on memory sticks at the beginning of the Convention and, subject to a sufficient number of high-quality submissions, proceedings of the symposium will be published in a more formal outreach, like the Springers series Studies in Applied Philosophy, Epistemology and Rational Ethics (SAPERE). The symposium is a sequel to the workshop “Foundations of Enactive Cognitive Sciences”, which took place in Windsor, on February 27-28th, 2013, sponsored by the Centre for Integrative Neuroscience and Neurodynamics, at the University of Reading. (http://sentic.net/bics ) to be held in Beijing next June. Papers submitted to BICS 2013 must be single-spaced in one column format within an area of 122 mm x 193 mm with 10-point Times-Roman font. Each paper must not exceed 10 pages including figures and references (papers beyond 8 pages are subject to page surcharge). All papers must be written in English using the Springer LNCS (Lecture Notes in Computer Science) style, including all tables, figures, and references. • short biography of the organizers; • list of 5-6 contributed papers (including titles, authors, contact information of the corresponding author). Proposals are due on or before 1 February 2013 and should be sent via e-mail (in either pdf or plain ascii text form) to the Special Sessions Chairs (Erik Cambria, Sanqing Hu, and Dongbin Zhao). Proposals will be evaluated based on the timeliness of the topic, the qualifications of the organizers and the authors of the papers proposed in the session. Sessions in which three or more papers are co-authored by the same person, or by authors from the same group will not be accepted. In its decision, the committee will try to realize a balance of the topics across the technical areas represented in BICS. Notification of acceptance will be sent to the organizers by 15 February 2013. Authors of papers included in successful proposals should submit a manuscript on or before 1 February 2013. Manuscripts should conform to the formatting and electronic submission guidelines of regular BICS papers. When they submit papers, there is a choice to indicate that their papers are special session papers. All papers will undergo peer review process. It is the responsibility of the organizers to ensure that their special session meets the BICS quality standards. If, at the end of the review process, less than four papers are accepted, the session will be cancelled and the accepted papers will be moved to regular sessions. Please join us in Singapore April 2013 for presentations and discussions on general intelligence, embodiment and human-level AI! (to find the Special Session on that page, scroll down till you see “CIHLI 2013, IEEE Symposium on Computational Intelligence for Human-like Intelligence” and click on that link). If your research touches human-level AI but not embodiment specifically, you may want to submit to the IEEE Symposium on Computational Intelligence for Human-like Intelligence, of which this Special Session is a part. One critical aspect of human-like intelligence is the capability to control bodies in the pursuit of a variety of human-like goals in environments, especially environments resembling the everyday human world. The achievement of this capability may be pursued via robotics, or via embodying synthetic intelligent software in virtual agents in virtual worlds such as 3D videogame-like worlds. Controlling embodied agents carrying out a variety of complex goals in complex environments is a difficult problem, requiring robust generalization and transfer learning ability, and practical creativity. Confronting this problem places various sorts of stringent requirements on the underlying computational intelligence system, which different architectures may seek to fulfill in different ways. The focus of this special session is on how architectures designed with artificial general intelligence in mind, cope with the challenges involved in achieving goals involving controlling bodies in worlds, especially worlds bearing some resemblance to the everyday human world. This Special Session is open to contributions on any topic directly related to the interfacing between artificial general intelligence architectures and the problem of controlling bodies in worlds resembling the everyday human world. Contributions presenting empirical or mathematical results are very welcome; contributions describing new approaches at an earlier stage of development are welcome as well, if the ideas are novel and clearly presented and argued for. — Autonomy: the capabilities of an embodied AGI to find itself its own motivations and goals. — Sensorimotor integration: methodologies for linking perception with action in an embodied AGI. The organizing committee comprises leading researchers with expertise in both AGI and cognitive robotics. In the aftermath of Turing’s anniversary, who famously proposed an interactive test of intelligence, the Spanish Network of Research in Cognitive Science –ReteCog- has chosen “INTERACTION” as the topic of its second meeting. The thematic network ReteCog is inspired by the “European Network for the Advancement of Artificial Cognitive Systems” (EuCognition). With the support of the Ministry of Science and Innovation of the Spanish Government, ReteCog aims to consolidate an interdisciplinary research network, composed by teams from 11 universities and the Spanish Science Research Council, in order to improve the understanding of cognitive systems, within the framework of the Spanish Research system. The “II Workshop ReteCog on Interaction-2013” will be articulated through two main symposia, one on “The dynamics of agent-environment interaction” that will cover experimental and theoretical contributions to the understanding of agent-environment interactions from a dynamicist perspective, and one on “Social and emotional interaction” where the question of how to relate the role of emotions and interactive processes in the understating of other people´s minds will also be raised. Participants will have the opportunity to take part in workshops, keynote speeches and networking events involving academic experts and prestigious international researchers. It will hopefully give assistants the chance to learn about hot topics, outstanding perspectives and current results in the area of “Cognitive interaction”. The “II Workshop ReteCog on Interaction-2013” invites contributions in issues related to the themes of both symposia (ecological psychology, perception-action coupling, sensorimotor contingencies and cognition, situated models of agent-environment interaction, philosophy of dynamical, situated and enactive approaches to cognitive science, self-organization and behavioural neuroscience, etc.). Researchers from these areas are all expected contributors or participants. The workshop and plenary conferences will be held at the Paraninfo Building of the University of Zaragoza from the 17th to the 18th of January 2013. Zaragoza is a lively and historical Spanish city, capital of the Aragón Region. It is located in the centre of Northeast Spain and is very well communicated with other major cities, lying in the centre of the Madrid-Barcelona and Valencia-Bilbao. * Submission deadline: December, 3rd, 2012. * Notification of acceptance: December, 17th, 2012. * Conference: 17–18th January, 2013.
http://www.theassc.org/conferences/assc_16 We are delighted to announce that the 16th meeting of the Association for the Scientific Study of Consciousness will take place in Brighton, UK, from July 02-06, 2012. The meeting will be organized by the Sackler Centre for Consciousness Science at the University of Sussex (www.sussex.ac.uk/sackler). Brighton, affectionately known as ‘London by the sea’ is a popular international conference destination. It is only 49 minutes by train from central London and just 30 minutes from Gatwick International Airport (LGW; there are also easy transport links from Heathrow). Brighton is a small city (population ~500,000) with conference facilities, hotels, restaurants, pubs, transport links, and the beach all within easy walking distance. The city is well known for its vibrant scientific, artistic, and digital communities, its café and pub society, and the beauty of the surrounding countryside (the South Downs National Park is just a couple of miles to the north). And in July, the weather is also usually very good as well! For more information on Brighton, see www.visitbrighton.org. To ensure that ASSC16 is special, we have arranged for it to be held in the superb Dome and Corn Exchange theatre complex, in the heart of Brighton’s artistic quarter (http://www.brightondome.org/) and is only minutes from the beach. These heritage buildings date from the early 19th century and were recently refurbished in a £2,000,000 project to provide an unparalled combination of elegance and efficiency. With the support of the city, we are confident that ASSC16 will not only be a premier scientific meeting, but a citywide celebration of consciousness science. We already have an exciting line-up of keynote speakers for 2012: Victor Lamme (University of Amsterdam), Tim Bayne (University of Oxford), Tania Singer (University of Zurich), Geraint Rees (University College London), and Josef Perner (University of Salzburg). We are also delighted to announce a ‘special lecture’ from Christof Koch (Caltech). In a major change from previous ASSC meetings, ASSC16 will take place over four full days, plus one tutorial day, and will run from Monday to Friday instead of across a weekend. We have made these changes in order to ensure that excellent scientific content can be combined with enough time for discussion, poster viewing, and the like. We do not expect registration fees to be substantially affected. We should also point out that the ASSC16 dates do NOT clash with the London Olympics!Calls for proposals for tutorials and symposia will shortly be available on http://www.theassc.org/conferences/assc_16 with a submission deadline of October 30, 2011. On behalf of the local organizing committee, we look forward to welcoming you to Brighton in 2012! The following video is a short excerpt from an interview to John Searle about his book Intentionality and Minds, Brains and Science. Will computers ever achieve consciousness? John Searle, Ph.D., is a professor of philosophy and cognitive science at U.C. Berkeley and author of Intentionality and Minds, Brains and Science. He challenges the notion that the human mind operates like a computer, pointing out that intentionality and other human faculties are not achievable through artificial intelligence. Aristotle’s convincing philosophy is likely to have shaped (even indirectly) many of our current beliefs, prejudices and attitudes to life. This includes the way in which our mind (that is, our capacity to have private thoughts) appears to elude a scientific description. 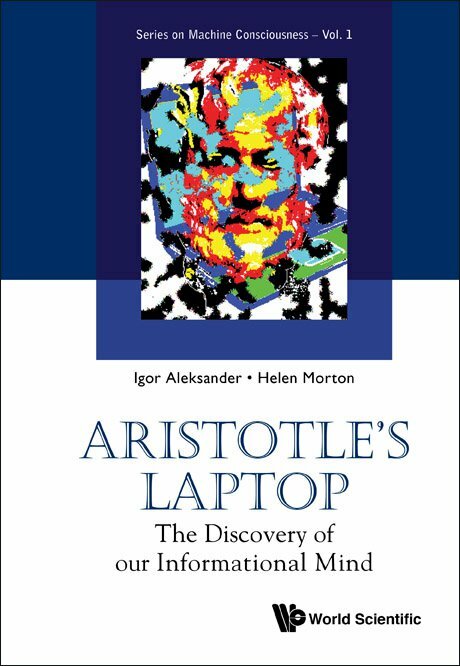 This book is about a scientific ingredient that was not available to Aristotle: the science of information. Would the course of the philosophy of the mind have been different had Aristotle pronounced that the matter of mind was information? This “mind is information” assertion is often heard in contemporary debates, and this book explores the verities and falsehoods of this proposition. Readership: Philosophers, scientists and those interested in consciousness and machine consciousness; readers of multidisciplinary books on machine analyses of consciousness.